The book - Urquhart and Glenmoriston by William MacKay - is here faithfully presented, covering the myths, legends and life of the Urquhart and Glenmoriston people of Scotland, from the earliest of times. The contents section in it's entirety has been left in tact, but due to the way search engines hate repition of contents, it was not incorporated into this page - click on the contents link to go to it. Each of the chapters contents is replicated at the start of each chapter you see. From basically the year dot to 1296. The focus is very much on the history of the people of Scotland, with a particular focus on the area of Urquhart and Glenmoriston. The early myths and legends of Scotland are covered, along with the history of the Picts and their struggles against the Scottish people, as well as against the Viking Norsemen. The occupiers of Urquhart Castle seem to change hands and it is interesting to note that no one called Urquhart is involved from what I can tell - Urquhart castle, incidentally, was considered one of the two most important castles in Scotland! OLDEN TIMES IN THE PARISH-BEFORE 1296. This section is very much concerned with the constant intrusions of the English into Scotland, Scotland repelling it's attackers, only to be attacked again and again. 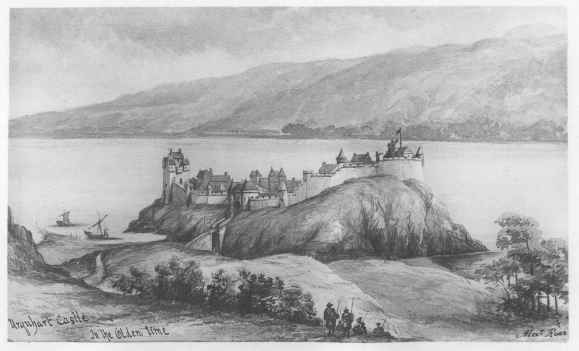 Urquhart Castle falls to the English on two occassions and is recaptured. 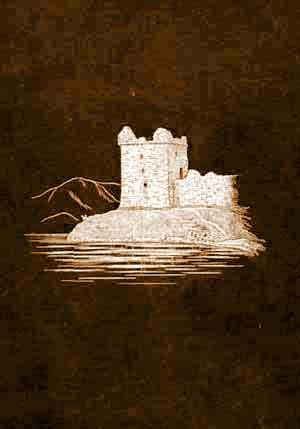 One one of those occassions, every Scottsman in Urquhart Castle died bravely on the battlefield trying to break the English siege, which had left them - the Scotts - in dire straits with too little food; everyone of them died a warriors death. On one occassion it's Scottish occupiers refuse to surrender the castle and are able to hold it even though the land was laid waste. In the last part, Scotland invades England, but is repelled and the Scottish King is taken prisoner, but is eventually released. OLDEN TIMES IN THE PARISH-1296 to 1362. OLDEN TIMES IN THE PARISH-1346 to 1455. OLDEN TIMES IN THE PARISH-1455 to 1509. OLDEN TIMES IN THE PARISH—1509 to 1535. OLDEN TIMES IN THE PARISH—1544 to 1560. OLDEN TIMES IN THE PARISH—1566 to 1626. OLDEN TIMES IN THE PARISH—1603 to 1640. OLDEN TIMES IN THE PARISH—1643 to 1647. OLDEN TIMES IN THE PARISH—1650 to 1668. OLDEN TIMES IN THE PARISH—1670 to 1690. OLDEN TIMES IN THE PARISH—1690 to 1708. OLDEN TIMES IN THE PARISH—1693 to 1736. OLDEN TIMES IN THE PARISH—1719 to 1746. OLDEN TIMES IN THE PARISH—1746. OLDEN TIMES IN THE PARISH—1746 to 1747. THE CHURCH IN THE PARISH—BEFORE THE REFORMATION. THE CHURCH IN THE PARISH—FROM THE REFORMATION TO THE REVOLUTION. Looking for the Urquhart and Glenmoriston pictures? Some of the appendices are in pdf form, as the tables and so on were too difficult to convert to html code from the scanned images. [afterwards Sir James Grant], and James Dollas, Mason at Garthkeen. To assist you in finding what you may be after, we have reprinted the index to Urquhart and Glenmoriston below. Just much the number to the chapter above, then look for the page in the chapter. The index is exactly like the original, except the original index spanned two columns to each page, whereas we just have one much longer one. Charles, Prince, 242, 272, 306 et seq. Charters of 1509, 77 et seq. Columba, 8, 327 et seq. Commonwealth, The, 169 et seq. Ministers of the Parish, 345 et seq. Reformation, The, 115, 116, 343, 345,. Robertson of Inshes, 179 et seq. Ross, Earls of, 19, 21, 23, 33, 35, 37,. 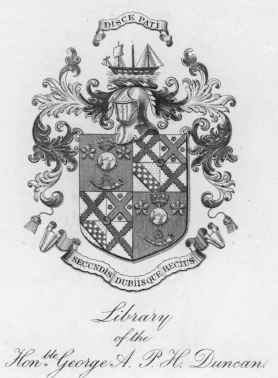 Seafield, Caroline, Countess of, 459. "PRINTED AT THE “ NORTHERN CHRONICLE " OFFICE, INVERNESS." " Urquhart and Glenmoriston " by William MacKay Back to the " Urquhart and Glenmoriston " Index / Table of Contents. History and Legends Back to the Index / Table of Contents for History and Legends, of which " Urquhart and Glenmoriston " is one book.